This week's Featured Retailer is Wee Little Changes! We're super happy to spotlight Wee Little Changes in this week's Featured Retailer post! April runs a great business and we thought you'd like to get to know her a little better. Read our interview below and find out what makes her tick! Tell us a little about yourself, your family, if you have little ones in cloth diapers, etc.-Hi! My name is April and myself and my family own and operate Wee Little Changes out of Wilmington, North Carolina. My husband and I have three wonderful and wild sons that keep us on our toes. We currently cloth diaper our youngest and love every minute of it. Wee Little Changes is dedicated to provide quality (and cute!) products that are good for your baby, the environment and your purse. I have done countless hours of research on all of our products, and each one has been tested by my family and found to be a winner. How'd you get started cloth diapering and what made you decide to open your own business? Wee Little Changes was dreamed of after my third son was born. It was quite ironic really. I think I wanted to go back to work but I really didn’t. I am fortunate enough to have that option and I am grateful for it! I started using cloth diapers when I realized my son had eczema and was irritated by just about everything that he came into contact with. It didn’t take me long to get sucked in to the world of cloth diapering; I loved every minute of it. There is such a feeling of satisfaction knowing that by diapering your baby with cotton instead of paper (and a bunch of other nasty stuff) that you are helping them, protecting the environment, AND saving money. No brainer for me! And then, all the styles and colors… I had to try them all! So, the story goes. What do you like best about being in the cloth diaper industry? The thing I enjoy most about this job is the interaction with other mothers. I love to troubleshoot and help them find that nighttime cloth diaper solution they so desperately need. There are so many options out there and very little community support. I am hopeful that cloth diapers will continue to be an “in” fad. I am so excited to see what the next few years have to offer in the world of cloth diapers. How much easier could it get? I guess they could wash themselves?! What are your favorite Knickernappies products and why? Love the One-Size with either the LoopyDo insert or the SuperDo insert. I am all for One-Size diapers in an effort to save money by not having to buy multiple sizes etc. Both the LoopyDo and SuperDo inserts are made of hemp and microfiber materials. The inserts are so trim and nice and wide in the crotch area without adding too much bulk. Another nice feature, is that they are sewn in a circle instead of all sandwiched together and makes drying time so quick compared to other hemp inserts. This is currently my go to diaper for night use. I usually use the SuperDo along with a Microfiber insert to get my little guy though a full night of slumber. 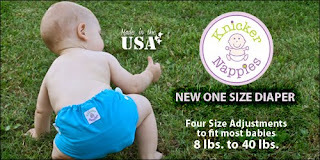 Special Offer: Save 10% off Knickernappies OS diapers! *Stay connected with Wee Little Changes by following them via the links below. Winners of the Cloth Diaper Bling Contest! Do you enjoy writing? We need Blog Contributors! Cloth diapering doesn't have to be complicated. The Doorknob Diaper Pail is super versatile! Oops, wrong detergent! Now what? Detergents: What's the best choice? 2 Weeks Old in a 2G!